An innovative and successful summer practicum for pre-service teachers is helping the Department of Curriculum and Teaching to achieve one of its primary goals: developing well-prepared graduates who are ready to lead and excel when they walk into the classroom. The flourishing practicum is in its 26th consecutive year on the campus of Auburn University. 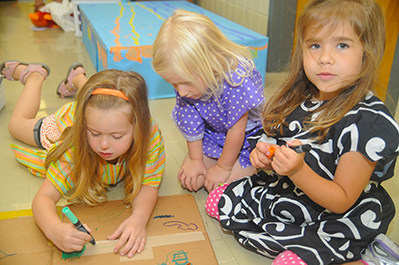 This well-designed outreach program for local pre-school students gives Auburn early childhood teacher education undergraduates their first real opportunity to teach. “These students plan and lead large and small group activities where learning in reading, writing, physical knowledge, music, and several other areas takes place simultaneously. This integrated approach, according to established research, is in line with how young children naturally learn.” said Dr. Sean Durham, an assistant professor in Auburn University’s College of Education. The six-week program has many unique learning opportunities that are a far cry from old-school “drill and grill.” For example, the students recently joined their teachers on a Tiger Transit ride to the Arboretum as part of their study of music. As they explored the beautiful outdoor space on the Auburn campus, the children listened and looked for examples of music in nature. They concluded the lesson with a group writing activity where they detailed many examples of music they found, including wind rustling leaves, rippling waterfalls and pool fountains, and singing birds. In addition to the morning sessions with the children, the pre-service teachers are also in afternoon classes with their professors exploring the literature on child development and innovative teaching practices. 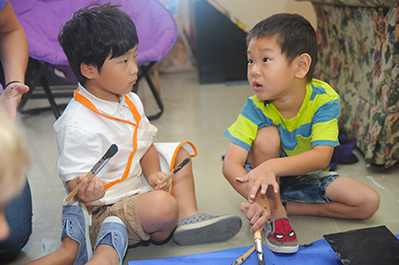 The program affords the pre-service teachers a valuable opportunity in multicultural education as about half of the children in the program have Korean or Chinese as their primary home language. Durham saw this interaction among cultures as an opportunity for research, and invited Dr. Jamie Harrison, who specializes in teaching English for Speakers of Other Languages (ESOL), to lead a new project. Multicultural connections have indeed been beneficial to the Summer Enrichment Program. Following last summer’s program, PowerTech America Inc., a unit of Seosan, Korea-based Hyundai PowerTech pledged $40,000 for new furnishings and materials. A one-hour visit on a typical weekday morning reveals many different concurrent activities. In one area there is a live saxophone demonstration, and afterwards children model their own saxophones out of foil and other materials. Another area has students playing an original math game called “Rainbow Fish” developed by Emily Bethea, one of the pre-service teachers. Out in the hall students are painting a large-screen backdrop for an upcoming stage presentation of Cinderella. And in another area children are building ramps and pathways using problem-solving and reasoning skills that are consistent with Common Core and developmental learning standards. Durham and his colleagues believe deeply that pre-service teachers must understand the foundation of a respectful educational process, and that this can be transformational for future generations. 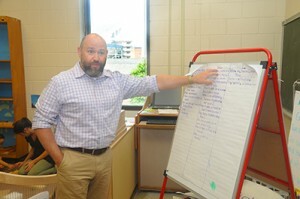 “We always want to find ways to make that a real part of the practicum,” Durham said. Keely Porter, one of the pre-service teachers engaged in the backdrop painting, said she was learning as much or more than the children she worked with. Pre-service teacher Landon Forbes agreed that the experience was enlightening. Durham said he hopes the program is still here in another quarter-century.